Liz Schulte's Bat Country: It's the Eye of the Tiger. It was also humid. Ridiculously humid. I think I sweated off gallons of water. I have been fighting off some dehydration ever since, not quit able to get rid of this constant thirst. Also lingering behind are two nasty blisters on my heels. Not the end of the world but it will prevent my from running for a couple days. So I have been doing yoga. I cannot describe how amazing it felt to stretch so intensely on the Saturday following the race. I really intend to make a better effort of running and doing yoga most days. I invented a delicious and carb filled dinner on Saturday night. It had whole wheat fresh pasta I bought at farmers market. I added in some chicken asiago sausage (my new favorite thing at only 110 calories), laughing cow lite cheese, and spices (garlic, onion powder, cajun seasoning, sea salt, and pepper). 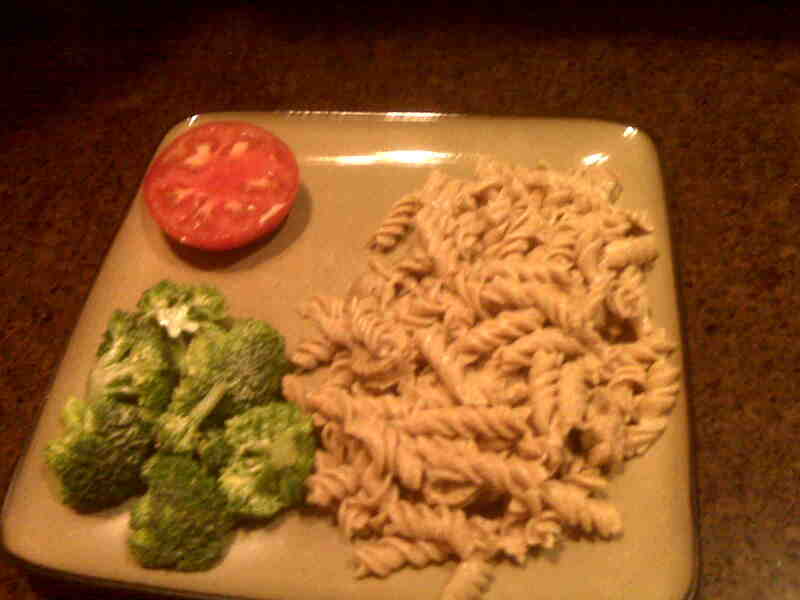 Broccoli and tomatoes on the side. Mmmmm is was so so delicous.